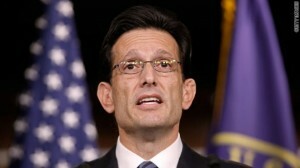 Who is Eric Cantor and why was he reelected to Republican leadership? Cliff Kincaid at Accuracy in Media is asking the same question. The record shows that Cantor had knowledge of the affair from an FBI whistleblower before the election but decided not to go public with the allegations of high-level misconduct by the CIA director. He stayed silent as Obama campaigned for re-election as a foreign policy statesman and efficient manager of America’s national security interests. But when he was given the David Petraeus scandal on a silver platter by an FBI whistleblower, more than a week before the election, Cantor turned the information over to the FBI, the same agency which had been conducting the cover-up on Obama’s behalf. Indeed, this cover-up is why the whistleblower came to Cantor. The predictable result of going to the FBI, headed by Robert Mueller, who was re-appointed by Obama, is that nothing was done and Obama won the election. If Cantor had gone public, the fallout from the scandal would have rocked Obama’s presidency just before Election Day. Because the allegations were based on inside information provided by a whistleblower and were true and could not be denied, Cantor’s revelations could not have been automatically dismissed as partisan or political in nature. The FBI whistleblower might have been persuaded to go public as well. Cantor’s failure to go public or even tell his colleagues about the scandal in advance is starting to attract more interest from the press. “House Majority Leader Eric Cantor has some tall explaining to do to the leadership on Capitol Hill,”notes Washington Post columnist Colbert King. King, a liberal, hit the target on this one, asking why Cantor only went to the FBI with the information. He asks, “Why didn’t Cantor raise the alarm? The majority leader needs to step up to the mic.” King notes that members of Congress are livid over being kept in the dark by the FBI about the scandal. The only reporter to confront Cantor about his strange handling of the explosive allegations is WTVR CBS 6 Richmond, Virginia, reporter Joe St. George. Cantor told him, “I had some information that I felt was information that raised some concerns and potentially could have some impact for our nation’s security.” St. George asked Cantor about the decision to not release the information publicly prior to the election. “I don’t want to comment, I don’t think it’s something we want to politicize—I think this is a national security concern,” Cantor said. While Cantor refuses to talk in detail about why he only went to the FBI with the information, the FBI whistleblower who confided in Cantor is now under attack by the liberal press as someone “obsessed” with the case and too close to one of the participants in the scandal. The lesson is clear: don’t go to the House Republicans with any inside knowledge of Obama Administration scandals. Cliff Kincaid is the Director of the AIM Center for Investigative Journalism and can be contacted atcliff.kincaid@aim.org.